Daniel Jay "Danny" Gokey (born April 24, 1980) is an American singer and former church music director from Milwaukee, Wisconsin. He was the third-place finalist on the eighth season of American Idol. After his placing on the show, Gokey signed to 19 Recordings and RCA Nashville at the beginning of a career in country music, releasing the single "My Best Days Are Ahead of Me". His debut album, My Best Days, was released in March 2010. Gokey started singing with his family in church, but stated he would rather record mainstream music than perform solely Christian/gospel music. He was the worship director at his church in Milwaukee, Faith Builders International Ministries, for several years. ^2 It was only announced that Allison Iraheta received the lowest number of votes this week. The other member(s) of the bottom two or three were never revealed. Gokey was nominated in his home state of Wisconsin for a WAMI (Wisconsin Area Music Industry) Award for Best Christian/Gospel Artist of the Year. As of September 2009, Gokey finished his tour with the other idols on the American Idols LIVE! Tour 2009, and he worked on his foundation, Sophia's Heart, which was set up to help disadvantaged children. Gokey, known for his many pairs of eyeglasses that he often wore on the show, had stated he might start an eyewear line to help raise funds for his foundation and Match Eyewear teamed with him for the Danny Gokey Eyewear collection. Launched in March 2012, the collection has exceeded sales projections with over 1.7 million in net retail sales. On September 1, 2009, Gokey signed with 19 Recordings/RCA Nashville, becoming the first third-place finisher to record with 19 and the first male Idol to be signed to a major country label. On November 19, 2009, 19 Recordings and RCA Records announced the release of the debut single "My Best Days Are Ahead of Me". Gokey's debut album, My Best Days, was released on March 2, 2010. It debuted on the Billboard charts at number four, and it netted Gokey the best opening-week sales by a debut country male in 18 years and the highest debut of digital downloads sold by any new country artist ever. In support of the album, Gokey was the opening act on Sugarland's Incredible Machine tour which began in April. Gokey also performed at country singer Darryl Worley's ninth annual Tennessee River Run festival in Savannah, Tennessee along with other artists such as Joe Diffie and Lee Brice. The event helped raise $200,000 for the Darryl Worley Foundation. On October 18, 2010, Gokey earned a nomination for Best New/Breakthrough Artist at the first annual American Country Awards. He revealed in an interview released on October 26, 2010, that he had recently recorded his own version of the Amy Grant song, "Tennessee Christmas," to be released to country radio as a holiday single. On November 21, 2010, Gokey was a part of ABC's pre-show event at the American Music Awards. Gokey released the single "Second Hand Heart" penned by Cary Barlowe, Shane Stevens and Josh Kear on July 4, 2011. He was one of opening acts on Taylor Swift's Speak Now World Tour. He also made an appearance in a TV movie with Candace Cameron Bure called Truth Be Told. Gokey left RCA Nashville in November 2011. Gokey released his EP Love Again in May 2012. It was self-released limitedly via his official website only as physical CD format. His memoir, Hope in Front of Me: Find Purpose in Your Darkest Moments, was published on October 1, 2013. Gokey kicked off 2014 with the release of his new single "Hope in Front of Me" under BMG. Gokey's second album, Hope in Front of Me, was released on June 23 and debuted at number one on the Billboard Christian Albums chart. In late August, "Hope in Front of Me" topped both the Billboard Christian Airplay chart (lasted 3 weeks) and Mediabase Christian Adult Contemporary chart. For the week ending of September 20, it also topped the Billboard Christian AC Songs chart. On December 5, the official lyric video for the second single "More Than You Think I Am" was released. In the spring of 2015, Gokey joined Natalie Grant's Burn Bright tour as a special guest, followed by The Bible Tour 2015 with Steven Curtis Chapman, Brandon Heath and Francesca Battistelli. "Hope in Front of Me" was nominated for Song of the Year at K-LOVE Fan Awards 2015, held on May 31 and one of award-winning songs at 2015 BMI Christian Awards, held on June 23. In July, "More Than You Think I Am" peaked at No. 6 on the Billboard Christian Airplay chart. In August, Gokey earned nominations for New Artist of the Year and Song of the Year for "Hope in Front of Me" at 46th GMA Dove Awards. On September 25, Gokey released the lead single "Lift Up Your Eyes" from his holiday album, Christmas Is Here, which was released on October 16. In October, Gokey joined NewSong's Beating Hearts Tour with Mandisa. In December, Gokey joined the 2015 K-LOVE Christmas Tour as a special guest. In February and March 2016, Gokey was a part of the Rock & Worship Roadshow Tour 2016. The official music video for "Tell Your Heart to Beat Again", the third single from Hope in Front of Me, premiered at K-LOVE online on March 28. On May 6, Tell Your Heart to Beat Again was released as an EP at digital retailers. On June 5, Gokey won Male Artist of the Year and Breakout Single for "Tell Your Heart to Beat Again" at the 4th annual K-LOVE Fan Awards. Gokey married his high school sweetheart, Sophia Martinez, on May 15, 2004. The two had been together since 1997. On July 9, 2008, four weeks before he auditioned for American Idol, Gokey's wife died from complications during her third surgery to treat her congenital heart disease. The couple had been together for 12 years, and Gokey credited her for his success. Sophia was a fan of American Idol and encouraged Gokey to be a contestant, and Danny started a foundation in her name, Sophia's Heart Foundation, with some of her family members who are also musicians. With branches in Milwaukee, Nashville and Sacramento, the organization's goals are to provide hope and help to homeless families, provide scholarships to deserving students and operate a thriving inner-city music and arts program. The facility in Nashville, opened in late 2011, has helped rescue over 60 families from life on the street. In 2011, Gokey began dating Leyicet Peralta. The two announced their engagement on December 25, 2011 on the Sophia's Heart website. They were married on January 29, 2012. Their son Daniel Emanuel was born on January 20, 2013. Their daughter Victoria Isabella was born on November 28, 2014. They're currently expecting their third child due September, 2017. ^ "Danny Gokey: 'Idol's' New 'Hero'". Extra. February 18, 2009. Retrieved October 16, 2015. ^ "Introducing Danny Gokey: Get to know Hollywood Hopeful Danny Gokey." American Idol. Archived May 23, 2011, at the Wayback Machine. ^ "American Idol finalists are church worship leaders" Associated Press via WNCT, February 20, 2009. Archived April 21, 2009, at the Wayback Machine. ^ a b Sun, Eryn (December 27, 2011). "Former American Idol Finalist Danny Gokey Engaged". The Christian Post. Retrieved October 16, 2015. ^ "Danny Gokey Biography". TV Guide. Archived from the original on April 2, 2009. Retrieved October 16, 2015. ^ Wiggins, Leslie Anne. "American Idol Top 36: Danny Gokey". WITI-TV Fox 6. Archived from the original on July 11, 2011. Retrieved October 16, 2015. ^ "Milwaukee's Gokey wows judges, makes 'Idol' finals" Tim Cuprisin, Milwaukee Journal Sentinel, February 18, 2009. ^ "Danny Gokey — "I Heard It Through The Grapevine" Audition — American Idol 8". Rickey.org. January 14, 2009. Retrieved October 16, 2015. ^ Cantiello, Jim (May 7, 2009). "'American Idol' Rock Week Makes Us Scream On Like Danny Gokey". MTV. Retrieved October 16, 2015. ^ "Top 2: Lionel Ritchie and Danny Gokey jam – The Marquee Blog – CNN.com Blogs". Marquee.blogs.cnn.com. May 20, 2009. Retrieved 2010-01-10. ^ Head, Chrystina (April 28, 2009). "East Troy Singer Beats Danny Gokey at WAMI Awards". WITI-TV Fox 6. Archived from the original on May 12, 2009. Retrieved October 16, 2015. ^ Gokey, Danny (October 1, 2013). "Outreach to homeless is my calling, my dream for Sophia's Heart is to make it a 'Harvard' for the homeless". Fox News Opinion. Retrieved October 16, 2015. ^ Borzillo-Vrenna, Carrie (2009-05-15). "American Idol's Danny Gokey Sees Rosy Future in Glasses". E! Online. Archived from the original on 2009-05-19. Retrieved 2015-10-16. ^ Shapiro, Rachel (March 26, 2012). "American Idol's Danny Gokey Launches Eyewear Collection". The Hollywood Reporter. Retrieved October 16, 2015. ^ "American Idol's Danny Gokey Signs to 19 Recordings/RCA Nashville". CMT. 2009-09-02. Retrieved 2015-10-16. ^ Mansfield, Brian (2009-11-19). "Danny Gokey switches singles". USA Today. Retrieved November 20, 2009. ^ "Danny Gokey Achieves Best First-week Album Sales by a Debut Country Male in 18 Years (press release)". Rendy Lovelady Management. March 10, 2010. Retrieved October 16, 2015. ^ Don Walker (February 9, 2010). "Gokey to tour with Sugarland". jsonline.com. Milwaukee Journal Sentinel. ^ "Darryl Worley's Tennessee River Raises $200,000". Country Music Television. September 27, 2010. Retrieved October 6, 2010. ^ Thompson, Gayle (2010-10-25). "Danny Gokey, Jennette McCurdy to Host AMA Red Carpet". The Boot. Retrieved 2010-12-04. ^ Mansfield, Brian (July 15, 2011). "Country dominates week's 'Idol' track sales". USA Today. Retrieved October 17, 2015. ^ Mansfield, Brian (March 3, 2011). "Danny Gokey added to Taylor Swift's summer tour". USA Today. ^ @dannygokey (January 25, 2011). "Twitter". twitter.com. ^ @candacebure (January 25, 2011). "Twitter". twitter.com. ^ "Danny Gokey to Appear in New Movie Truth Be Told". Taste of Country. February 2, 2011. ^ Thompson, Gayle (November 21, 2011). "Danny Gokey Parts Ways With RCA Records". The Boot. Retrieved October 17, 2015. ^ Mansfield, Brian (December 16, 2010). "Danny Gokey planning new single for early 2011". USA Today. ^ "Hope In Front of Me: Find Purpose in Your Darkest Moments by Danny Gokey | 9781612914756 | Hardcover | Barnes & Noble". Barnesandnoble.com. Retrieved 2015-11-17. ^ "artistspotlight | American Idol's Danny Gokey Releases New Single 'Hope in Front of Me'". Christian Activities. 2014-01-06. Retrieved 2015-11-17. ^ "Danny Gokey Win It Before You Can Buy It | WJTL FM 90.3 - Christ. Community. Music". Wjtl.com. 2014-06-16. Retrieved 2015-11-17. ^ Fred Bronson (July 4, 2014). "'American Idol' on the Charts: New Album 'Hope' Brings Danny Gokey First Billboard No. 1". The Hollywood Reporter. ^ "Chart Highlights: Sam Smith's 'Stay' Hits No. 1 On Pop Songs". Billboard. ^ "USA TODAY's airplay charts". USA TODAY. 15 October 2012. ^ "Chart Search - Billboard". billboard.com. ^ "The Bible Tour 2015". thebibletour2015.com. ^ "K-LOVE Fan Awards". K-LOVE. ^ "2015 BMI Christian Awards Celebrates Christian Music's Best Songs, Songwriters and Publishers". BMI.com. ^ "Nominees | The 47th Annual GMA Dove Awards". Doveawards.com. Archived from the original on 2016-01-11. Retrieved 2015-11-17. ^ "Danny Gokey - Christmas Is Here - Amazon.com Music". Amazon.com. Retrieved 2015-11-17. ^  Archived September 11, 2015, at the Wayback Machine. ^ "2015 KLOVE Christmas Tour". klovechristmastour.com. Retrieved 2016-05-06. ^ Lamb, Bill (2009). "Danny Gokey". About.com. Retrieved December 28, 2011. ^ "RootsWeb: Database Index". ancestry.com. ^ "'Sophia Linnette Gokey Obituary'" Church and Chapel Funeral Services, July 2004. ^ a b c "Milwaukee man says he's prepared to give his all to make 'Idol' finals" by Tim Cuprisin, Feb. 13, 2009, Milwaukee Journal Sentinel. ^ "American Idol Selects First Three Finalists", AP story run in the New York Times. 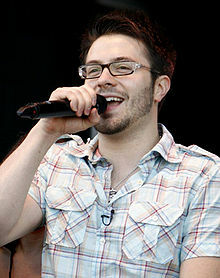 ^ "‘Idol’s’ Danny Gokey: My Wife ‘Is The Reason For My Success’" Access Hollywood, February 20, 2009. ^ "Danny Gokey Photo Gallery" WITI February 18, 2009 Archived May 12, 2009, at the Wayback Machine. ^ "Sophia's Heart". Retrieved May 21, 2011. ^ "'Latest News: Danny & Leyicet Engagement Announcement'" Sophia's Heart, December 25, 2011. ^ "American Idol's Danny Gokey Is Married : People.com". PEOPLE.com. ^ O'Donnell, Kevin (January 21, 2013). "Danny Gokey Welcomes Son Daniel Emanuel". People. Retrieved January 21, 2013. ^ "Danny Gokey Welcomes Second Child". Retrieved December 4, 2014. ^ "2016 Winners". doveawards.com. October 11, 2016. ^ "Danny Gokey – Chart history (Billboard 200)". Billboard. Prometheus Global Media. Retrieved October 6, 2010. ^ "Danny Gokey – Chart history (Country Albums)". Billboard. Prometheus Global Media. Retrieved October 6, 2010. ^ "Danny Gokey – Chart history (Christian Albums)". Billboard. Prometheus Global Media. Retrieved October 6, 2010. ^ "Danny Gokey – Chart history (Holiday Albums)". Billboard. Prometheus Global Media. Retrieved November 10, 2016. ^ "Danny Gokey – Chart history (Latin Albums)". Billboard. Prometheus Global Media. Retrieved November 10, 2016. ^ Mansfield, Brian (March 16, 2010). "Adam Lambert EP sales rise 2,000% after 'Idol' appearance". USA Today. ^ Wan, Tiffany (January 22, 2013). "American Idol: Where Are They Now — Season 8's Danny Gokey". Wet Paint. Retrieved November 10, 2016. ^ "Love Again - Danny Gokey | Songs, Reviews, Credits". AllMusic. All Media Network. Retrieved November 10, 2016. ^ "Danny Gokey – Chart History (Hot 100)". Billboard. Prometheus Global Media. Retrieved October 6, 2010. ^ "Danny Gokey – Chart History (Country Songs)". Billboard. Prometheus Global Media. Retrieved October 6, 2010. ^ a b "Danny Gokey – Chart History (Christian Songs)". Billboard. Prometheus Global Media. Retrieved November 10, 2016. ^ a b "Danny Gokey – Chart history (Christian AC)". Billboard. Prometheus Global Media. Retrieved November 10, 2016. ^ "Danny Gokey – Chart History (Adult Contemporary)". Billboard. Prometheus Global Media. Retrieved November 10, 2016. ^ "Danny Gokey - The Comeback". Daily Play MPE. Retrieved April 10, 2017. ^ "Tennessee Christmas - Single by Danny Gokey". iTunes Store (Canada). Apple Inc. Retrieved November 10, 2016. ^ "If You Ain't in It - Danny Gokey | Release Info". AllMusic. All Media Network. Retrieved December 9, 2016. ^ "Better Than I Found It - Danny Gokey | Release Info". AllMusic. All Media Network. Retrieved December 9, 2016. ^ Whitburn, Joel (2011). Top Pop Singles 1955–2010. Record Research, Inc. p. 363. ISBN 0-89820-188-8. ^ "CMT : Videos : Danny Gokey : My Best Days Are Ahead of Me". Country Music Television. Retrieved October 6, 2010. ^ "CMT : Videos : Danny Gokey : I Will Not Say Goodbye (Short Version)". Country Music Television. Retrieved October 6, 2010.